This is another installment in the 10 views series, featuring photos from my recent visit to the Holmes County, Ohio Amish community. I’ve included a few comments and links to relevant posts that you might enjoy. Sugarcreek is technically in Tuscarawas County. It’s often the first little town visitors to the area pass through. Many of the buildings in Sugarcreek’s “Swiss Village” downtown area are meant to evoke Swiss-style chalets. 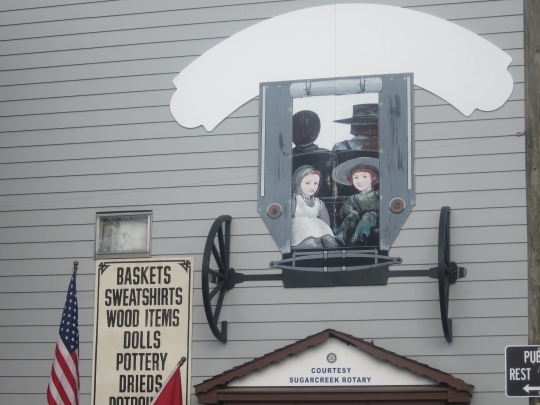 Read more on the pluses and minuses of Amish tourism. Two-wheeled travel. On Amish bicycle use. Not sure what happened to this buggy, though it doesn’t look pretty. Game time. On Amish & sports. A gathering of some sort. Possibly a viewing? More on Amish funeral practices. Outside Sol’s Exchange in Berlin. 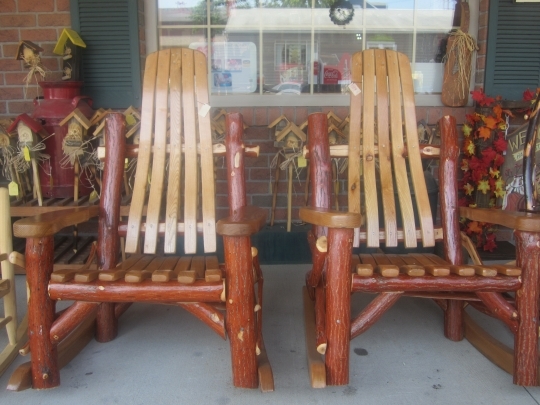 Amish-made outdoor furniture. Fill up your tank. Boyd and Wurthmann is popular with locals and visitors. Can be hard to find a seat. 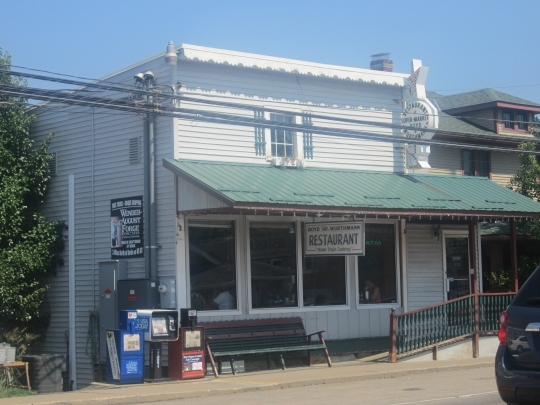 What’s your favorite Amish restaurant? For more photos, try the original Holmes County 10 views post or all posts in the series. I really enjoy the pictures. 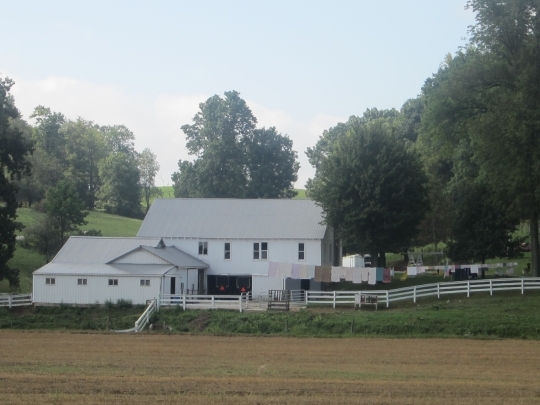 There is some beautiful Amish farms there from these pictures. We just got back from a trip to Berlin Ohio…in Holmes. The views, esp. in this Fall season, are much more breathtaking than these photo shows. Awesome!!!!! Very nice “tour.” Good format, too. Thanks for pictures you share. 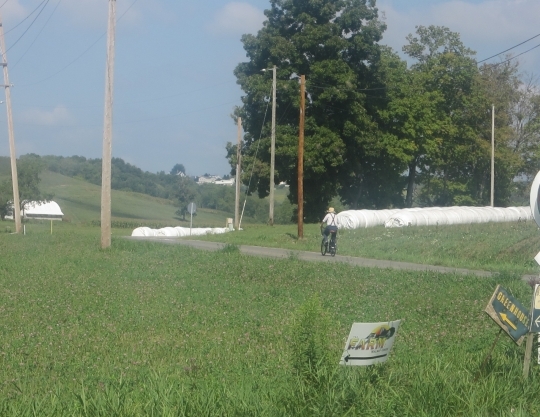 I love Holmes County and hope to live about an hour from there….someday! I opened this post right after arising in the morning. What a nice way to start the day. Thanks you. I am in Holmes County right now! 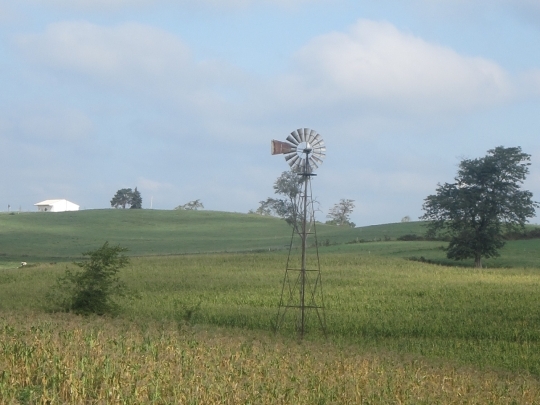 Is that farm just below Millersburg on CR 68? I am almost certain it is a friends parents place! The parents of the groom to the wedding I attended on Friday. 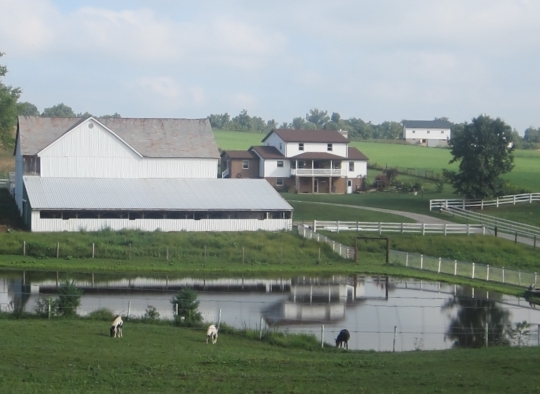 loved the photo of the farm with the pond. Not alot of farms today have their own pond. That must be a treat for the kids that live there to go swimming in the summer and for ice skating in the winter. Love all these pictures of all these farms. 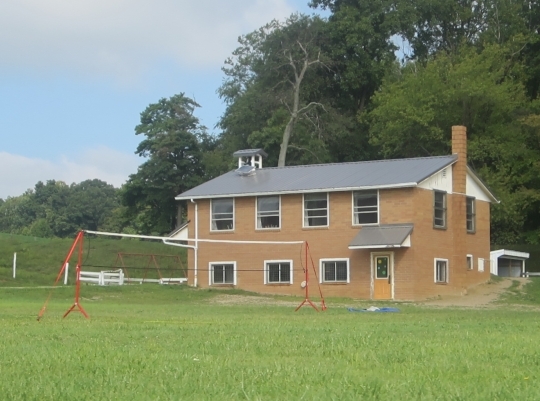 My favorites were the Amish restaurant with the bench and a gorgeous ramp out front and the orange brick house with the volleyball net to the side. I’d like that home. Thanks for the info about that building being a school. A bookworm such as myself loves the coincidence that a school was my favorite building. The hardest part about these posts is deciding which shots to use. If I use the rapid fire function on my camera there is even more to sort through. Glad they were enjoyed. I am always so impressed with the lack of litter in the pictures. It seems that around the countryside where I live, there is litter everywhere you look. Florence, unfortunately, litter (and graffiti, which is just a more permanent form of litter) are fairly rampant in my town. Might be why these types of shots appeal to me too. I like the scenic view with the pond in photo #2. Photo #9 brings back memories of walking up the ramp to the restaurant. I was also impressed with the good information at the Amish America links you provided about tourism, bicycles, sports, and funerals, and how few comments some of those undated posts have. Yet you kept on writing, Erik, even if there weren’t very many comments. I wonder how many comments those posts would generate if written today? Good observation Linda, on the few comments. There’s probably one explanation why–those were actually published as “pages”. Not to bore anyone, but in WordPress, the blogging program I use, you have the option of creating either posts or pages (more or less the same, except that posts automatically appear at the top of the main page when you publish them, and pages are undated and just “appear” somewhere out there in the internet 🙂 ). I did a lot of those linked articles for the Amish Online Encyclopedia section a couple of years ago, and released them all one day in a massive burst (I think around 80 at one time). In hindsight, maybe should have drip-dripped them over time 🙂 When I get around to adding more to AOE that may be what I do. Love the pictures.thank you I enjoy looking at your site each morning. I’m interested in those rockers—they sure are hefty looking! I’ve seen the bent-wood versions (for indoors), but the two you’ve pictured here certainly seem sturdy/weatherproof enough to survive decades outdoors! How much do they weigh? The first photo shows how clever “advertising” can be! I LOVE 3-D effects (I used to do a lot of bulletin board displays, and always tried to use some 3-D element). Was it actually done by the Amish themselves? Just curious! 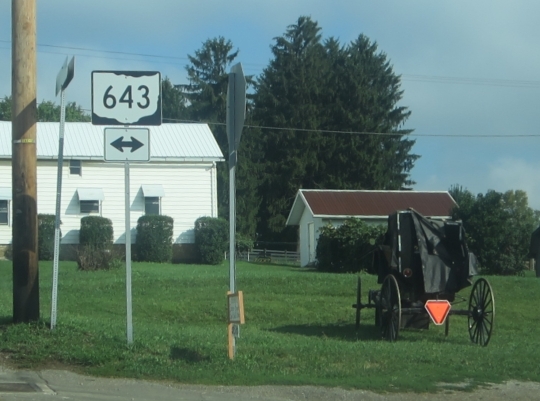 Keep ’em coming—I can’t get enough of Amish area photos! 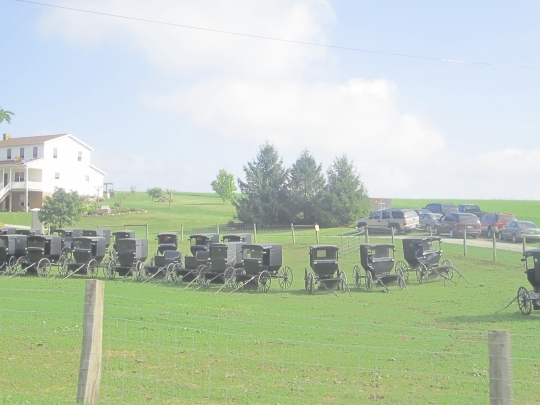 Are the Amish Environmentally Minded?